@babau I think it's pretty bad (or at least not what current builds of Shops are looking for). Drawing cards is always potent on artifacts, since a weakness of most Shops builds is maintaining pressure in the late game against an opponent who has stabilized. But this card seems bad---much worse than Staff of Nin, Coercive Portal, or even The Immortal Sun. Unlike these other incremental card advantage engines, Coveted Jewel gives you the cards immediately. You do also get three mana to play them (since you likely do not have other mana left after paying the 6-mana casting cost), but three mana goes a lot less far in Shops than in most decks. On later turns, the three mana is likely to be irrelevant. 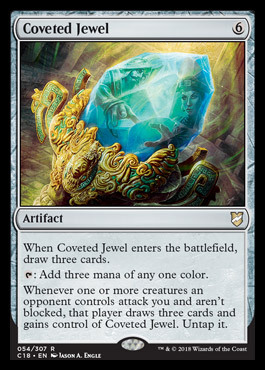 By contrast, if your opponent somehow gets control of the Jewel, it's a complete disaster: three mana and three cards is enough for them to find artifact hate, Storm you out, etc etc. So this card seems to be a huge risk for relatively little reward, and outclassed by other options for what it does (allowing you to push ahead in a long, grindy game on a stabilized board). EDIT: Since the card cost 6 mana I didn't at first consider applications outside Shops, but this card is obviously totally nuts with Goblin Welder. So that's something to keep in mind, if the environment ever shifts towards being more Welder-friends (for instance, with a Mental Misstep restriction). @evouga that was my first thought. Welder+Thirst seems like it wouldn’t mind this. But that’s not a deck rn. this card in mud is: if you have 6 mana draw 3 for 3 mana and put 1+1+ counter to ravager.........immortal sun is possible better but for me not a bad play!!! This seems like a fun card to play around with in a UR Artificer deck I was tooling around with some time ago. With Goblin Welder and Master Transmuter to retrigger it, and a full suite of Thirst for Knowledge to use with it, it's a pretty good payoff card. That card looks like a one off Tinker target in Grixis Thieves deck. Some play Wheel of Fortune for extra style and winning. If you don't want to win (or play Jar instead), play this. It also happens that this new jewel is also a good mana sink for colorless Mana Drain which Thieves also runs and you can now convert all that colorlessness into spicy colours. And I guess you can always steal it back with Dack!! not.